The Unbeatable Squirrel Girl: Squirrel Meets World is a really fun read. I feel like I’ve been saying that about a lot of books lately, but it’s true. I’m having a ton of fun reading this year. There are a lot of hilarious and cute middle grade books out there. Doreen Green is hilarious, sweet, kind, and definitely leaps before she looks. She’s a little overeager at times, but everything she says and does comes straight from her huge heart and desire to help. She’s a girl with a giant squirrel tail, buck teeth, and the strength-size ratio of a squirrel. And she’s fourteen (although she felt like quite a young fourteen). This book is filled with humour, but also some serious topics like responsibility, bullying (both in person and online), friendship, relationships with parents, friends moving away, starting at a new school. 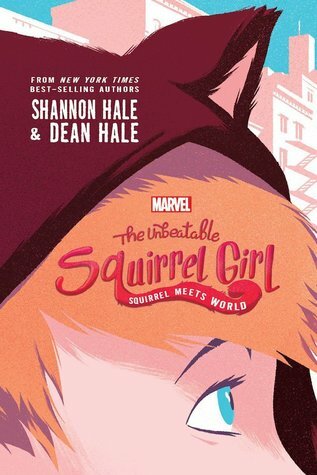 Told from multiple perspectives and unique voices, including Doreen/Squirrel Girl, Ana Sofia (a deaf character living in a hearing world), and even Tippy Toe (a squirrel), Squirrel Meets World is easy to follow and an engaging novel that allows the reader to see things from a lot of interesting and often funny angles. It also includes some text message conversations (including some with some of our favourite Avengers). There’s also a lot of adventure, mystery, technology — including squirrel traps, robots, flying drones with spinning blades — and some pretty cool battles. This book has a lot of awesome for middle grade (and older) readers. I’ve seen a few Squirrel Girl cosplays that piqued my interest in this character. Now that I’ve read the first of the novels, I definitely want to read the second (available now!) and also catch up on all the comics. Have you read Squirrel Girl?